I am using student version of creo. and Afer making some assemblies, and in the meacnism mode, I cant add the servo motor to a joint, or an axis, as no axis marks are shown. Please give me a hint on this. In order to do this, your assembly components need to be constrainined with kinematic connections, not fixed connections. The default placement is fixed connections. 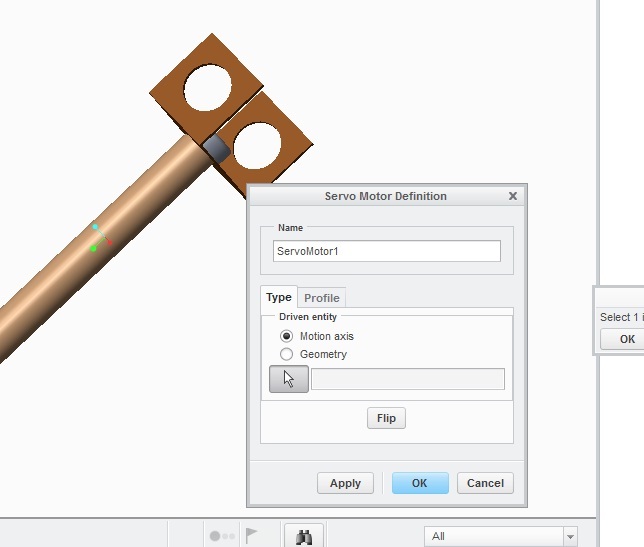 Use the drop down menu to the left of it to see the list of available kinematic connections. For rotary motion, use the Pin Join option. For linear motion, use the Slider option. Once you have kinematic connections, you'll see the joint icons in the graphics window. There are a number of good video sessions done in ROBOTalk over the years on this topic. Use the tag cloud to find replays using the robotalk_2013 and robotalk_2014 tags. 2013 are all community videos. 2014 are all WebEx streaming videos. I followed your suggession and it worked but with some aspects. during assembling the componenets (And chaging constraints as you said) I found that the pin join and slider option were not working, and in cylenderical option I got a green check only, but not when I used the option pin joinn or slider, as no green check mark come in that option. I joined components with my own need based orientation but i dont know why this is not working esp. if i want a slider motion to execute. That's odd. Did you remove all the fixed constraints before adding the pin or slider constraints? Creo would not be happy with both. If you want to Private Message me a link to the files, I could take a look at it for you. No, I didnt. And would be great if your can refer me to a document from where I can learn on constraints. Currently, I am following some opensource video tutorials and some pdf tutorial files. But I am missing the constraints change part. Thanks for all your help, Scott ! Okay, please create a ZIP of your assembly (File, Save As >, Save a Copy, set Type to Zip), post it online somewhere (Drive, OneDrive, Dropbox, etc.) and then send me a Private message with a link to the files. I can create a video of the entire process for you.